Nik never fixes the cars anymore. He used to change the oil and sometimes more ambitious stuff, but there would always be a point when he’d mumble, “Every time…” and then he’d drive off to the auto parts store, returning an hour and a half later with a new tool or a replacement for something that hadn’t been broken at the start of the day. I was reminded of that when I showed up at the in-laws to seal up the crack that I’m pretty sure has been freezing their kitchen pipes for the last 35 years. They don’t have electricity, so a frozen pipe could stay that way for months in a bad year. I’d spied the crack this fall when I was trying to figure out the freezing pipe thing. It’s between the original house and the addition, which houses the kitchen. On the inside of the house the join between the main house and the addition is obscured by a wall that’s maybe fourteen inches thick. Definitely something fishy in there, but there are many mysteries of this house, and I’m not going to solve that one this winter. I also looked in the crawlspace, but the crack on the back of the house seemed a more probable culprit. On a chilly-but-not-brutally-cold Sunday I optimistically showed up with my can of foam and cat’s paw tool. 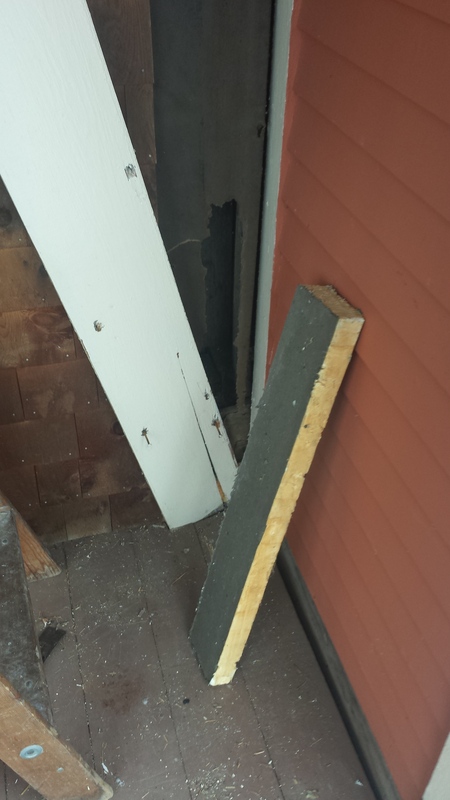 The crack in question is between a piece of wide trim on the kitchen wall and the intersecting wall of the dining room in the original house: an inside corner. As tempting as it was to attribute the pipe-freezing air intrusion to the crack I could see from the back porch, I know that sealing at the surface, whichever surface that may be, is rarely effective at stopping air movement. Generally air doesn’t move into the house as straight line wind. Because the inside of the house is a different pressure from the outside of the house, air is driven around, behind, between, over, across, through, down, under… You can’t see the leakage paths from either side, and the things you can see are usually not the important leaks. Imagine submerging your house in water. You’d get water squirting in all over the place, and putting a band aid over any one hole would only increase the amount of water flowing through some other hole. So the best way to stop air leakage is to seal at the structure of the building, behind the finish materials that are put there to hide the leaky cracks. Knowing what I do about how houses are put together I could guess pretty well what is behind that trim board, and I knew it could be sealed without leaving a messy bead of spray foam where the in-laws would have to look at it every day. Marshaling all my positive thoughts about how this little oil change was going to pan out, I started wailing away at the nails holding the trim board in place. The kitchen is probably over 100 years old, while the original house is well over 200 years old. Even pulling nails is an unknown in a house that old. But these nails turned out to be familiar factory nails and my cat’s paw made short work of them. Removing the actual trim board was pretty difficult, but I won’t dwell on that, because once I swung it aside, what greeted me on the other side was nothing like what I was expecting. Behind the trim board, leaning away to the left, I did not find the new wall butted up to the old wall, as I expected. instead, I found this tar paper, which is great because the tar paper keeps the wall dry and it shows that the folks who built the addition did a good job. But what’s that hole in the tar paper at the bottom, and why does it look so … empty? What I found was a pretty massive hole about 5 inches wide, 6 inches deep, the full height of the wall. If you’re having trouble picturing it, imagine that the kitchen wasn’t built attached to the old house. Instead it was built, freestanding, about five inches away from the old house. To hide the five-inch-wide alleyway between the two buildings a lovely piece of wide trim was fastened over the space. Where the door goes through from the kitchen to the dining room a very wide door jamb hides the “alley” so you’re not looking between the buildings. Can’t see it? Nothing to worry about! Except frozen pipes. And mice. Since I came with only my foam gun and cat’s paw I was manifestly unprepared to cope with something about as big as a closet. I considered what this gap between the buildings must look like from the top, and on the front of the house. The only place there are pipes are at the back porch, so it seemed as though that’s where the “problem” is, but truthfully the problem is this structural thing that was built into the house 100 years ago, girding the addition with a giant air leak. Can’t fix it this year. A happy procrastinator, I embraced that thought and turned my attention to a good-enough job for the pipe problem. As I was pulling debris out of the hole so I could fill- and seal it something else occurred to me. Mice. All that stuff was mice bedding, and there are always mice in the kitchen. Without addressing the mouse problem anything I do to protect the pipes would likely be undone by mice reestablishing their path to the warm grocery store within. The in-laws had some sheet foam stored away, and I happily accepted those as a supplement to my foam gun and cat’s paw. But mice have no problem burrowing through sheet foam. It was about 1pm and I could feel a run to the building supply house (30 minutes away) coming on. What material could keep mice at bay? There’s no electricity at the house, but by some miraculous combination of frontier moxy and space-age technology they do have internet. I set the mother-in-law to searching for mouse-proof insulation. Go ahead. Try it. We got nothing. If you find something awesome, please share! Anyway, that spared me a trip to the building supply house. I have come up with a plan that I think is ingenious and will work. I didn’t have the materials with me that November day, but I have to go back and do the whole thing (attic, front wall, crawlspace) next summer anyway, so I can return with everything I need and do it real good. 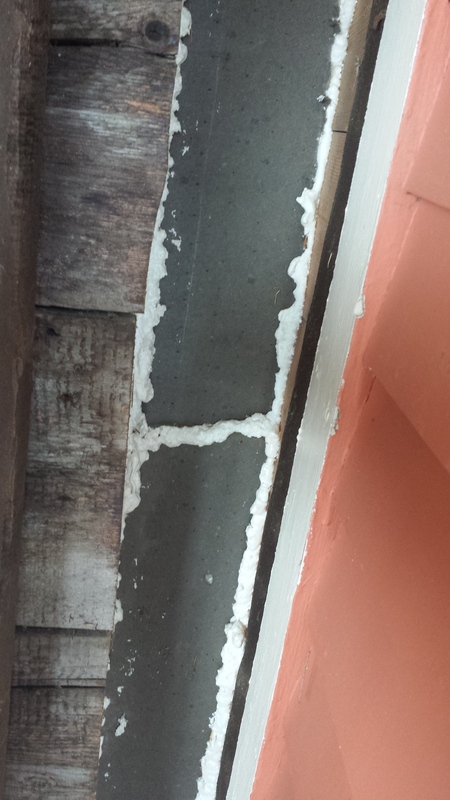 Tune in then to see how it worked out and see drawings of my mouse-proof air sealing approach. What I did for this winter is pretty poor, but I’m excited to do it well next summer, including cutting down on mouse intrusion. Here’s a case where fixing a frozen pipe problem is going to do a lot to improve comfort in the building, save fuel, reduce the need to humidify and fix a rodent problem. Victory for efficiency. Air sealing is the most important part of preventing freezing pipes. I’ve pieced in reclaimed foam board, filled the cavity as well as I can, and sealed all the bits together with my one-part spray foam. The incomplete part is that I couldn’t get to the top to seal that well, and I didn’t go under the porch to seal the bottom well. Next summer: connecting air sealing in the attic and the crawlspace, and mouse-proof! Alright! I feel like we¹re famous now that we¹ve been included on Energy Freak Show! Thanks for doing this work and for writing about it so well.